Paul Mellon was one of the turf’s most important, and enthusiastic breeder/owners during the middle to late decades in the twentieth century. He operated his Rokeby Stables in Virginia to supply quality Thoroughbreds for his racing stables in both the US and in Britain. In 1968 Mellon bred a handsome bay colt that would carry his black and gold silks to victory in the Epsom Derby three years later. The colt’s name was Mill Reef and he was trained by Ian Balding and ridden in all fourteen of his career races by Geoff Lewis. Mill Reef would go on the win the Eclipse Stakes, the King George VI and Queen Elizabeth Stakes and then the Prix de l’Arc de Triomphe to become the Champion horse of Europe that year. Mill Reef was sired by Never Bend, a headstrong son of Nasrullah who was a champion at two in the US but did not reach his full potential as a three year old, due in large part to his roguish behaviour. The dam of Mill Reef, Milan Mill was a non winner but possessed a strong pedigree. She was sired by Princequillo out of stakes winner Virginia Water by Count Fleet. Virginia Water was a daughter of the good stakes producing mare Red Ray by Hyperion. Mill Reef did not inherit his sire’s nor grand sire’s headstrong ways, possessing a wonderful temperament toward his human associates. He did have a bold and determined demeanour on the track and was always game and honest when racing. Mill Reef won his first two races as a two year old winning his début in the Salisbury Stakes and then the Coventry Stakes at Royal Ascot by six lengths. His next race at Maisons-Laffitte would be his first defeat when beaten by then French top two year old My Swallow in the Prix Robert Papin. He came back to England to win the Gimcrack Stakes by ten lengths over Green God and then finished his solid two year old season winning the Dewhurst Stakes at Newmarket. His championship three year season started well enough when he won the Greenham Stakes easily. Mill Reef then met up with another top three year old in the form of the great miler Brigadier Gerard, who subsequently defeated Mill Reef in the 2000 Guineas. After this race, Mill Reef would not be beaten again, however it must be said that he did not meet Brigadier Gerard again either. Mill Reef won the Epsom Derby in a very convincing manner over Linden Tree and Irish Ball. He followed this triumph with convincing victories in the King George and Queen Elizabeth Stakes, the Eclipse Stakes and the Arc, sealing his championship honours. Among the vanquished in the latter races were group one winners Caro, Pistol Packer and Acclimitazation. Mill Reef was kept in training as a four year old and began the season with a ten length pulverising of the opposition in the Prix Ganay in April. After his narrow win in the Coronation Cup, he was found to be suffering from a virus and was kept out of training. This turn of events meant that his highly anticipated rematch with Brigadier Gerard would have to wait until the autumn. In early September during a routine work at his training grounds on the Kingsclere gallops, Mill Reef took a stumble and shattered his foreleg. With his life in the balance, Mill Reef began a long, arduous journey to recovery in which his considerable intelligence and patience would be tested. This aspect to his personality along with the great skill of the veterinarians entrusted to save his severely damaged leg became an important turning point to the future of the breed. The sesamoid bone, which was completely broken along with a two and one-half inch piece of bone displaced from his cannon, gave the vets a very complicated set of procedures to save the horse’s life. Dr. Charles Allen was specially flown in to oversee the operations. Ian Balding was insistent that Mill Reef was to be kept as immobile as possible. An on-site operation theatre was set up in a building at Balding’s Kingsclere training yard. A six hour operation that involved the insertion of a stainless steel compression plate held by three screws to pin the broken pieces of the cannon bone was used as well as the setting of his shattered sesamoid. The operation was a success and was followed by a lengthy three months of care and convalescence. Along with his on site handlers led by groom John Hallum, the utmost in human/equine co-operation and genuine affection was on display while Mill Reef’s leg heeled. Paul Mellon was determined to keep Mill Reef in England for stud duty once it was apparent that the horse would survive his brush with death. In late January of 1973, the staff at Kingsclere gathered to say good-bye to their beloved champion as he was deemed fit enough for travel to the National Stud in Newmarket. The decision by Mellon to stand Mill Reef in England has had an everlasting effect. This decision also paved the way for other well bred and highly anticipated young sires to stand in England, Ireland and France after they were retired from the races, and not be whisked away for larger syndication prices for stud duty elsewhere. 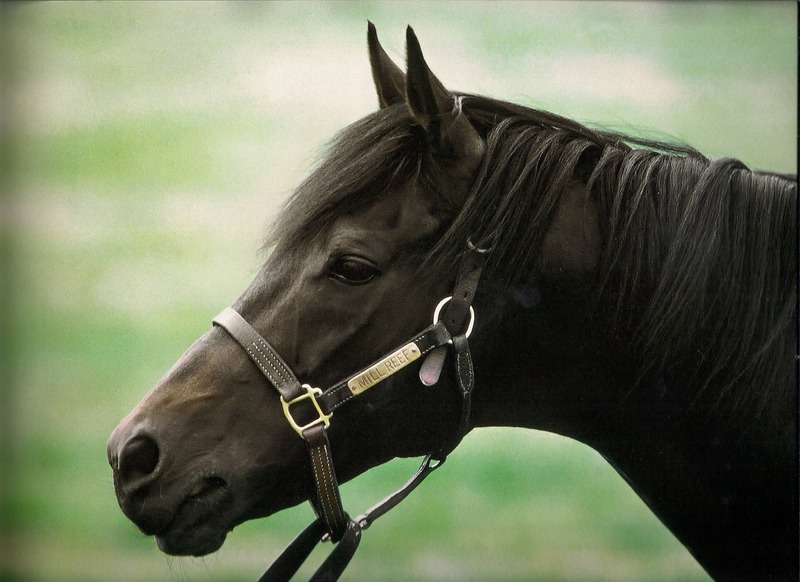 Mill Reef established himself as a sire of classic winners and then as a sire of lasting influence through his sons and daughters. Acamas won the Prix du Jockey Club and the Prix Lupin; Behera won the Prix Saint Alary; Creator took the Prix Ganay and the Prix d’Ispahan; Diamond Shoal scored in the Grand Prix de Saint-Cloud; Ibn Bey won group one stakes races in Ireland, France, Germany and Italy: Lashkari won the inaugural Breeder’s Cup Turf; Milligram, winner of the Coronation Stakes and the Queen Elizabeth II Stakes are just the tip of the iceberg of grade/group one winners sired by Mill Reef. Shirley Heights, from the second crop by Mill Reef, was a double Derby winner having taken both the Epsom and Irish Derbies in 1978. He also added the Dante Stakes and the Royal Lodge Stakes to his six career victories. Retired to the Royal Stud at Sandringham, Norfolk with a lifetime racing record of 11-6-3-1, Shirley Heights became one of the best sons of Mill Reef at stud. Here he would sire Slip Anchor (Epsom Derby); Infamy (Canadian International); High Estate (Coventry Stakes, Royal Lodge Stake etc); Shady Heights (International Stakes); Valley of Gold (Italian Oaks); and Darshaan (Prix du Jockey Club defeating Sadler’s Wells and Rainbow Quest) among his best. Darshaan became a prime source of Mill Reef blood to future generations of top class Thoroughbreds. He sired Yorkshire Oaks winners Key Change and Hellenic; Mutamam (Canadian International); Cerulean Sky (Prix Saint-Alary); Kotashaan (Breeder’s Cup Turf, San Juan Capistrano etc); 2003 European Horse of the Year Dalakhani (Prix de l’Arc de Triomphe, Prix du Jockey Club etc); and Mark Of Esteem (2000 Guineas, Queen Elizabeth II Stakes etc). The latter two would be the key links to Mill Reef on this branch of the male line as they would both be successful sires. Dalakhani by Darshaan would sire Conduit, a champion in both Great Britain and the US (King George VI and Queen Elizabeth Stakes, St. Leger Stakes, Breeder’s Cup Turf twice etc); Reliable Man (Prix du Jockey Club); Irish champion Chinese White (Pretty Polly Stakes); Moonstone (Irish Oaks); and Duncan (Irish St. Leger Stakes) so far in his sire career. Mark Of Esteem by Darshaan sired 2006 Epsom Derby winner Sir Percy, who is a current shuttle sire between Lanwades Stud, Newmarket and Rich Hill Stud in the Waikato Basin area, New Zealand. Sir Percy is off to a promising start to his stud career as he is the sire of a high percentage of winners from runners from his first few crops including graded stakes winners Sir Andrew and Alla Speranza. Mark Of Esteem has also sired group winners High Accolade, Ordinance Row and Reverence but has unfortunately been retired from stud duty at the age of fourteen, due to a loss in fertility after colic surgery. The Mill Reef influence would also be passed on by his son Doyoun. Winner of the 2000 Guineas and the Craven Stakes in 1988 for his breeder and owner the Aga Khan IV, Doyoun entered stud in Ireland at the Aga’s Gilltown Stud. He also served mares at Ballymany Stud for the Aga Khan. In 1998 he was sold to Turkish interests. After Doyoun left for Turkey his sons Daylami and Kalanisi would each raid the Breeder’s Cup Turf in the US and win in consecutive years. Both horses were trained in Europe. Irish bred Manndar won the Manhattan Handicap and the Turf Classic Stakes in another raid on US stakes by a son of Doyoun. Attempts to re-acquire Doyoun were unsuccessful and he stayed in Turkey until his passing in 2002 from cancer. Returning to Mill Reef, he would sire many other stakes winners such as; Irish champion three year old Entitled; Fairy Footsteps (1000 Guineas); King Of Clubs (Premio Emilio Turati); Marooned (Sydney Cup); from the Queen’s great mare Highclere came Milford (Princess Of Wales Stakes); Pas De Seul (Prix de La Foret); and a full brother of Diamond Shoal bred by Paul Mellon named Glint Of Gold, winner of the Prix de Saint-Cloud, the Grosser Preis von Baden, the Europa Preis, the Derby Italiano, the Grand Prix de Paris, and the Gran Criterium, all group one races. Mill Reef was loved by all who knew him but perhaps none more so than his proud breeder/owner Paul Mellon. Mellon commissioned three life sized bronze statues to be made in the horse’s honour, one of which is at the National Stud in Newmarket where he stood his entire stud career. Another graces the stables at Kingsclere where had lived during his racing career. The third statue is at Rokeby Farm where he was born. 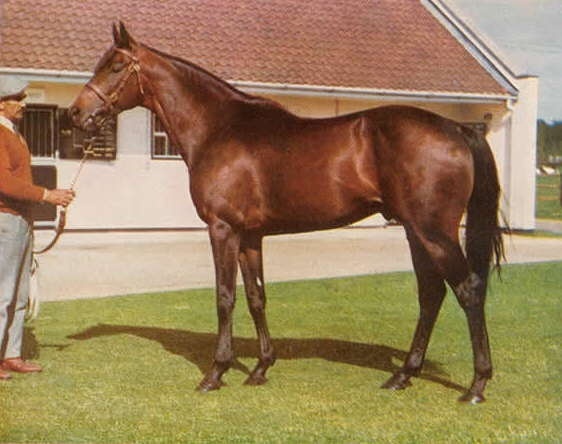 Mill Reef was not a large horse standing 15.3 hands, but was of perfect proportion and had a rich bay coat. He had a smooth and balanced action with quick acceleration when in motion. When Thoroughbred enthusiast get together to discuss who was the best they had ever seen, Mill Reef’s name would inevitably be mentioned. He is held on the same level of esteem as Nijinsky, his contemporary Brigadier Gerard, Sea Bird, Ribot, and many other such luminaries of the European turf. In July of 1985, Mill Reef underwent a heart operation. However the great horse was steadily declining leading the vets to the conclusion that his condition would never improve. As Mill Reef’s condition worsened, the inevitable decision had top be made. The great Mill Reef was humanly euthanized on February 2, 1986. He was eighteen. The following year he would posthumously lead the sire list in Great Britain, his second such title. Fast, classy, handsome, intelligent and brave, Mill Reef was an amazing individual. Mill Reef and Paul Mellon go together to make for pedigrees for the future. /racing has benefited greatly by both horse and man. One of Mr. Mellon’s favorite sayings, “Outside of the horse is good for the inside of man”. Reliable Man raced against one of NZs best Dundeel and beat him in Australia when trained by Chris Waller (top trainer) so I was quite impressed with this horse he was injured and retired to stud in NZ am interested to see how his off spring preform on the track when the time comes. I think Dalakhani now shuttles to Australia so will watch with interest. I’m a stallion handler at Westbury stud where reliable man stands. His foals have made a huge impression and this is his 3rd season of serving here and it’s his largest book!! Which shows you what people think of his foals and him! One of the five best I ever saw. Paul Mellon was a brilliant sportsman and very gracious to racing. A man like him deserved a horse like Mill Reef.